You know how much hard work it is creating content, don’t you? Well… for all that hard work, you need to get some rewards for doing it! This is where a content conversion funnel comes in. A content conversion funnel is where you share a piece of content that gets attention from your potential audience and then you lead them down a path to a potential sale. This could be text, images, video, voice… whatever form your content takes. Our PRISM framework will help you understand how to go from sending a tweet all the way through to getting a sale. You get inbound traffic from a variety of sources and this traffic goes to a piece of content with a content upgrade. This is something of value related to the post that people can download in return for an email address. If someone doesn’t join the email list, they are retargeted with Facebook ads. If they do join the email list, they are offered a product for sale. If they buy this, they may be offered another product. If they don’t buy it, then they are retargeted with ads on Facebook. There is also email retargeting with a series of emails that ultimately end in an offer. Some sales funnels are very aggressive with many steps in them and many different types of offers. But don’t be put off, you don’t need to be that aggressive. Someone could sign up for an email list and your next offer could be a free trial of your product or service. If they don’t go for this, you could ask them if they want to go to a webinar. Either way, you are looking for people to take the next step. It’s very difficult to be successful with social media or content marketing without an understanding of sales funnels. Webinars are a great way of generating sales for your product or service. If someone is prepared to allocate 45 minutes to 1 hour to a webinar with you, there’s a good chance that they are interested in your products or services. They may not all be buyers but you will have potential buyers on the call. Promotion to previous webinar registrations. Read our post on how to build 1,000 subscribers in your next webinar. Once you have your subscribers, you need to make sure they turn up! We typically provide emails and a video that explain the importance and value of the content. We also only promote our webinars about 7 to 10 days before the event because we get fewer people registered but more attendees! The product launch funnel is a term coined by Jeff Walker, who came up with this formula for launching a product. It starts with a survey to your audience and results in a 4-part video series to sell. When you are selling an expensive product, you need to provide a lot of value over a period of time before the offer is made. So, over a 7- to 10-day period, you send a series of videos. At the end, you offer the product or service for a limited time. Typically, this launch opens on a particular date and then closes on a different date (i.e. it’s not open all the time). This funnel is just about creating leads. After you create the lead, you can link this to the funnel so that it sells! You might have a lead-capture landing page on your site and you drive traffic to this page. When someone signs up, they are brought to a thank-you page. If they arrived on the landing page but didn’t go to the thank-you page, you know they didn’t sign up so you can retarget them with ads. There is where you extend the lead-capture funnel to a sale. You capture the lead and then, on the next page, you offer the person the opportunity to buy a product or service. If they buy, you could offer them the opportunity to upgrade. You could also go straight to a sale. In the following example, your website visitor gets an offer to buy an event ticket. If they don’t buy the event ticket, they are retargeted with an ad. If they do buy the ticket, they are offered the chance to upgrade the ticket. If they don’t buy the upgrade, they are retargeted with an ad. What skills do you need to build the full, end-to-end content marketing funnel process? Ok… so before you fall off your chair, remember that you can build a funnel piece by piece and the most important thing to do is keep improving your skills. The second most important thing to do is figure out which bits you will do and which bits other people will do. Content creation – You’ll need to create content for blogs, lead-gen guides, ads etc. You’ll also need to have someone who can help with creating imagery or video. Advertising – When you want to drive more traffic into your funnel, you’ll need skills such as knowledge of Facebook ads. Conversion funnel analytics – Measurement of what you are doing is just as important as doing it. Without measuring, you really don’t know what worked and what didn’t work. Tools – You’ll need to have a good knowledge of the tools that are available, how to set them up, and how to get the best use out of them. Social media – People buy from people they know, like and trust. There is no better channel than social media for this to happen. Email marketing – If people are not going to buy from you immediately, you’ll need to retarget them with ads or using email. Email is free (except for the cost of the tool), so use it more often. Payment providers – You’ll need to understand which payment providers to use to support the collection of money from product/service sales. Content funnel optimization – When you create all that content, you’ll need to optimize it so you can get more social, organic traffic. Content promotion – No matter how good you are at creating content, you still need to promote the content. You’ll need to understand how to find good opportunities to promote it, learn how to build relationships with influencers, how to optimize your content for maximum sharing etc. If you need help in any or all of these areas, you should read about our club! Understanding how to design, implement and optimize a conversion funnel is the most essential skill you need as a content marketer. …It’s not easy so help is often required. What is your opinion/feedback? I’d love to hear from you. 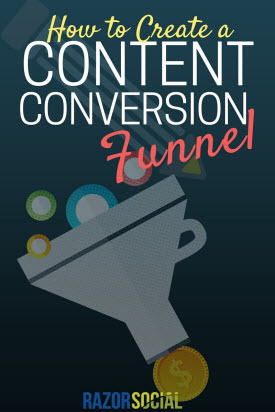 Are you building content conversion funnels?